We provide an extensive range of continuity testers that are fabricated using superior quality raw material and are highly appreciated by our customers for their outstanding performance and reliability. Available in customized specifications, these continuity testers are offered at industry leading prices. 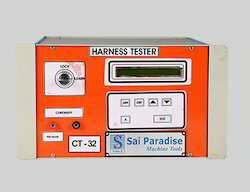 Sai Paradise cable harness tester (CT- 32) is designed to test cable harnesses, cable looms, cable assemblies. This machine comes in four models each depending on the number of points to be tested. These machines has the capacity to locate shortends, open connections, interchange and extra points. In this machine we can check upto 32 points loom of harness. Master list of harnesess stored through learning a good harness or from the PC through serial. CT-32 thorough- ly analyses continuity checking, board checking, displaying pass count, changing cable number to displaying the learnt data can also interface with label printer. Easy diagnosis using self tests. 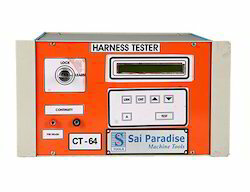 Sai Paradise cable harness tester (CT-64) is designed to test cable harnesses, cable looms, cable assemblies. This machine comes in four models each depending on the number of points to be tested. These machines has the capacity to locate shortends, open connections, interchange and extra points. In this machine we can check upto 320 points loom of harness and as per your no of points you can select the machine. Easy diagnosis using self tests . Learn Lock key ensures access to tester's function. Easy user interface through LCD alphanumeric display. Harness Data and Label Data transfer to and from a tester.